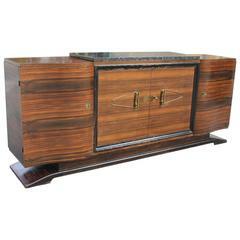 Beautiful French Art Deco Macassar ebony wood sideboard or buffet designed by Maurice Rinck. Mahogany wood interiors, with all adjustable shelf, with three doors one drawer, all with gilt bronze hardware with marble top. 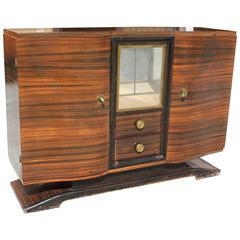 Original finish, circa 1940s.